The GCC countries are witnessing huge investments in solar sector in order to meet the growing demand for energy. Several solar power projects were awarded in last few years across the GCC region to promote power generation from cleaner sources of energy. With the expansion of solar network in GCC region, solar equipment market is set to witness robust growth over the next six years. According to 6Wresearch, GCC Solar Equipment Market is Projected to Touch $8,852.5 Million by 2022. Saudi Arabia and UAE are the key revenue generating countries in the entire GCC region. Solar photovoltaic equipment's accounted for major revenue share in the overall market in 2015, with Saudi Arabia being the largest contributor. Solar Photovoltaic is expected to maintain its dominance throughout the forecast period. Solar CSP equipment has also captured key share in the overall GCC market equipment due to large solar irradiation and availability of land. The report thoroughly covers the GCC solar market insight and solar industry growth by technology and country. The report provides an unbiased and detailed analysis of the on-going trends, solar market insights, opportunities / high growth areas, market drivers which would help the stakeholders to device and align their market strategies according to the current and future market dynamics. • Historical Data of GCC Solar Equipment Market Revenues for the Period 2012-2015. 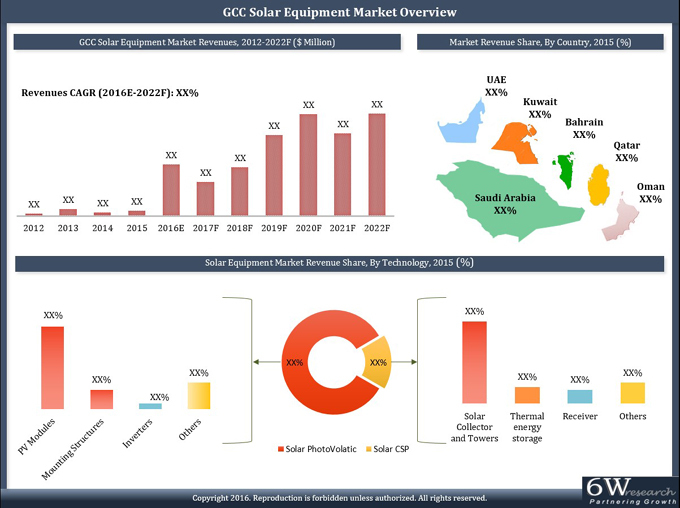 •	Market Size & Forecast of GCC Solar Equipment Market Revenues until 2022. •	Historical Data of GCC Solar Equipment Market Revenues by Technology for the Period 2012-2015. •	Market Size & Forecast of GCC Solar Equipment Market Revenues by Technology until 2022. •	Historical Data of GCC Solar Equipment Market Revenue by Country for the Period 2012-2015. •	Market Size & Forecast of GCC Solar Equipment Market Revenue by Country until 2022. •	Historical Data of GCC Solar Equipment Market Revenue by Technology by Country for the Period 2012-2015. •	Market Size & Forecast of GCC Solar Equipment Market Revenue by Technology by Country until 2022. •	Historical Data of GCC Solar Equipment Market Revenue by Country by Technology for the Period 2012-2015. •	Market Size & Forecast of GCC Solar Equipment- Market Revenue by Country by Technology until 2022. 9.5	Qatar Solar Energy W.L.L. Figure 1	GCC Solar Energy Investment Outlook. Figure 8	GCC Renewable Energy Target for Countries.